As you might know, the Milky Way Galaxy, in which we are all floating, has a black hole with a mass 4.5 million times bigger than that of our sun at its very center. So, when NASA says a documented occurrence in that vast pit of darkness “raises questions about the behavior of this giant black hole and its surrounding environment,” I get a little nervous. Fortunately, the observation they’re talking about is little cause for alarm. 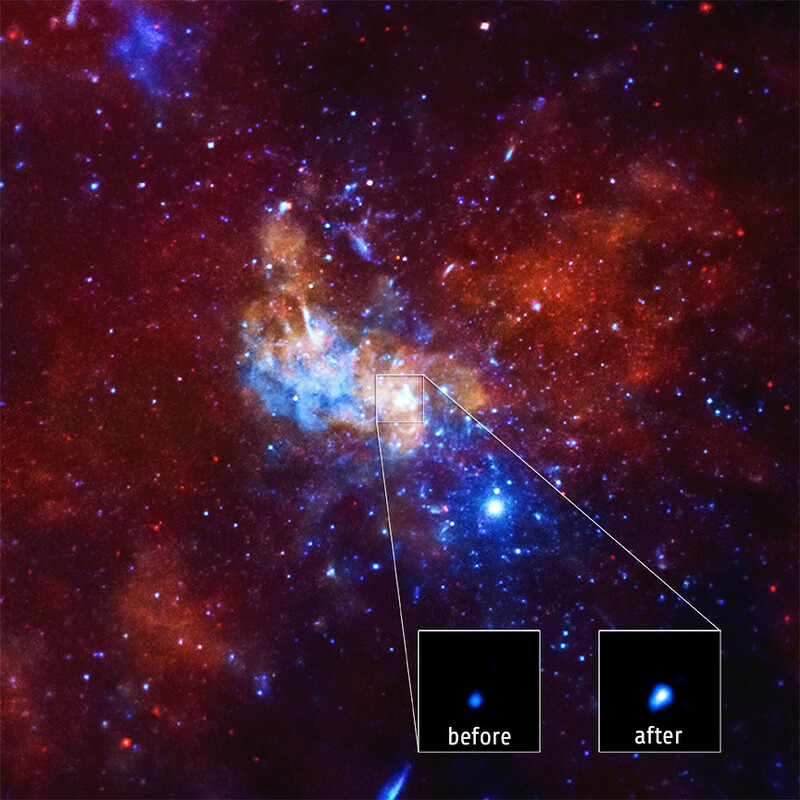 Last year, astronomers report the largest X-ray flare ever detected from the Milky Way’s supermassive black hole. NASA’s Chandra imaging project caught this flare, which was 400 times brighter than the black hole’s usual output. Researchers also saw a second large X-ray flare a little over a year later. The supermassive black hole at the center of our galaxy, called Sagittarius A*, or Sgr A*, is about 26,000 light years from Earth, is estimated to contain about 4.5 million times the mass of our sun. Astronomers made the unexpected discovery while using Chandra to observe how Sgr A* would react to a nearby cloud of gas known as G2. On Sept. 14, 2013, Haggard and her team detected an X-ray flare from Sgr A* 400 times brighter than its usual, quiet state. This “megaflare” was nearly three times brighter than the previous brightest X-ray flare from Sgr A* in early 2012. After Sgr A* settled down, Chandra observed another enormous X-ray flare 200 times brighter than usual on Oct. 20, 2014. Astronomers estimate that G2 was closest to the black hole in the spring of 2014, 15 billion miles away. The Chandra flare observed in September 2013 was about a hundred times closer to the black hole, making the event unlikely related to G2. Using models of the area around Sgr A*, the researchers were able to suggest two possibilities: that it could have been caused by an asteroid that strayed too close to the black hole and was torn apart, its remains being heated to enormous temperature before slipping below Sgr A*’s event horizon; or it could be caused by field lines of the black hole’s powerful magnetic field snapping apart and reconnecting, a process—common on the Sun—which releases strong bursts of energy. “It’s an unsolved mystery,” Haggard says. “Such rare and extreme events give us a unique chance to use a mere trickle of infalling matter to understand the physics of one of the most bizarre objects in our galaxy,” Gabriele Ponti of the Max Planck Institute for Astrophysics in Garching, Germany, a co-author on the study, said in a statement. But mostly, the space agency really isn’t quite sure what caused the outburst. “The bottom line is the jury is still out on what’s causing these giant flares from Sgr A*,” added Gabriele Ponti. The new findings were revealed on January 5 at the 225th American Astronomical Society meeting in Seattle. В камере “царя”, пирамида “Хуфу”, есть черный камень. А змея, на лбу у “Сфинкса” и других, соответствуют двум созвездиям змеи, расположенных по диагонали в отношении “Змееносца”.